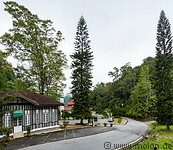 Fraser’s Hill (Bukit Fraser in Malaysian) is a hill station at about 1500m of altitude in the Titiwangsa mountains of west Malaysia, at the border between the states of Selngor and Pahang, 98km north of Kuala Lumpur. The name comes from Louis James Fraser, a Scotsman who set up a tin mining operation there in the 1890s. 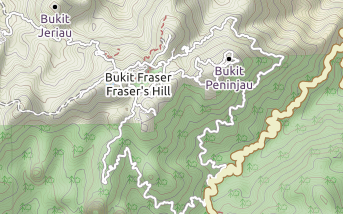 In 1922 a hill station opened up in Bukit Fraser. This covered 140 hectares of land and had over 50 km of jungle paths. The characteristic British colonial mansions which are visible nowadays date back to this period. There is at least one golf court (Fraser's Hill Golf Club) in the Fraser hills. The Paddock is a centre for horse riding in the Fraser's hill. It includes an archery range. Besides trekking, the Bukit Fraser is a good place where to spot birds. The hill station has over 270 species of local and migratory birds who live there. The only way to get to Fraser's hill is by car. From the main road (interstate 55) a narrow and winding one way road leads to Fraser's hill. Accommodation options include some hotels and resorts, as well as private bungalows which are available for rent.